Legendary Real Madrid striker and thirty-two year old, Raul is our annual LLTO Best Player 32 & Over. And the crafty old vet proved once again this season that there still is some gas left in the tank with a impressive 18 goals this season. The total tied his result from last season and the squad’s captain has now surpassed 300 career goals for Real Madrid. The aging star is currently at 306 goals for the Galacticos and hopes to add on that total next season despite all of the fresh faces that will be joining the team. Raul is probably not too happy with the way the season ended this year and I am sure the club expects immediate results with all the additions next season. There still is no word on how much more limited Raul’s role in the offense will be with the additions of Ronaldo and Benzima to the roster, but the old man showed Madrid fans everywhere that he still can play the game at a very high level. Despite all the huge additions by Real Madrid, Raul deserves plenty of minutes next year. He still can be an offensive threat and he also possesses valuable experience to the club as a natural winner. 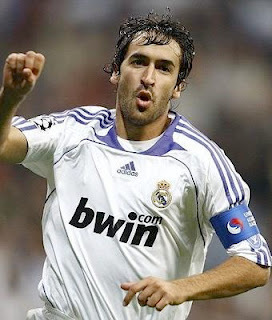 Raul has won 6 La Liga titles in his career and 3 Champions League titles as well. Next season will be a complicated time for Real Madrid as they search for a new identity with a lot of freshly acquired talent, but if Real Madrid really wants to return to their league title winning ways, then they will heavily rely on #7 next season.